A number of types of bumps can develop on the inside of the eye. More often that not, the bumps are benign and not cause for alarm. The most common bumps are styes, but these inflamed oil glands are red in color and quite tender to the touch. A white bump, on the other hand, is typically an indication of a blocked gland or cystic lesion. Treatment options for bumps on the inside of the eye are influenced by the cause of the lesion, so it's best to consult a doctor or ophthalmologist. Most medical professionals can diagnosis a bump from its appearance. No special tests are usually needed, assures the National Institutes of Health. One potential cause for the white bump is a blockage in the duct to a meibomian gland, resulting in what's known as a chalazion. The meibomian glands secrete fluid to lubricate the eye, but can become clogged from time to time. When fluid is unable to escape from one of these glands near the eyelashes, it can build up and lead to inflammation. Like styes, these bumps subside on their own. However, you can encourage drainage and ease tenderness by applying a warm compress on the affected eye for 10 to\ -15 minutes at least four times a day, according to the National Institutes of Health. Inclusions cysts can also develop on the inside of the eye, especially when affecting the conjunctiva, which is the thin membrane along the inner surface of the eyelid. These bumps result from epidermal cells multiplying within a small area until they form a white, painless mass on the inside of the eye. Doctors can puncture these cysts with a needle or excise them from the skin. 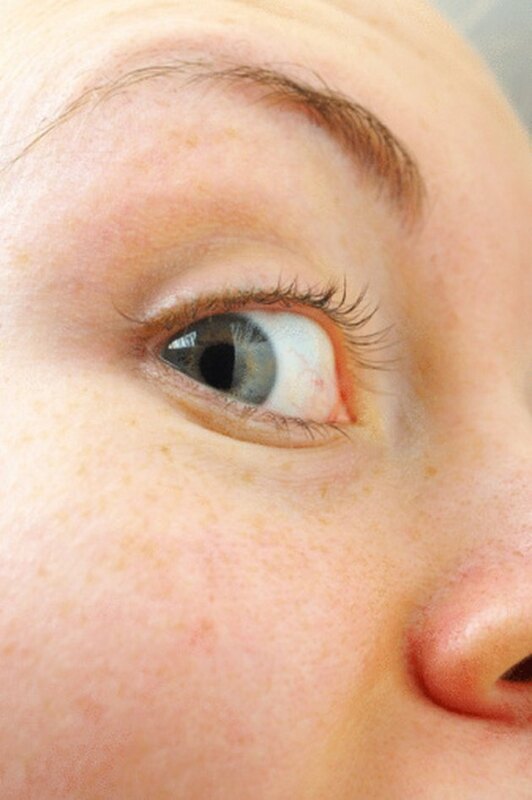 If the white bump isn't an inclusion cyst pr chalazion, it may be a sudoriferous cyst, which is the result of a blocked sweat gland along the eyelid. These blister-like lesions are filled with fluid, but shouldn't be punctured like an inclusion cyst. They'll recur without surgical excision. Though most bumps on the inside of the eye are benign, you should pay close attention to any lesion that distorts the contour of the eyelid or disrupts the lashes, explains David R. Jordan, an ophthalmologist and orbital and lacrimal surgeon. These could be indications of malignancy. Recurrence after removal of a lesion may also indicate malignancy.